As we commemorate the 50th anniversary of the seminal moment of the Mexico City Games, when Americans John Carlos and Tommie Smith raised a black-gloved fist from the medals podium, GlobalSport Matters looks back at the year from a global sporting perspective. From the World Series helping a wounded Detroit heal to athletic innovations that trace their origins to those Olympics, 1968 served as a critical pivot point in the role sports plays in society and introduced the modern era of athlete activism. To see all of our stories, please click here. Before the International Olympic Committee awarded the XIX Summer Olympic Games to Mexico, questions regarding the altitude of its capital, Mexico City, and its effect on athletic performance had already sprouted. Through October, GlobalSport Matters examines how events from 1968 resonate today. Competitors in the long jump, shot put and high jump believed the city’s location approximately 7,350 feet above sea level would benefit them because of the thinner air. Distance runners and swimmers believed they would be at a disadvantage because they wouldn’t be able to take in as much air as they had during their training sessions. “What Mexico City did in an offhand way was point out that if you can prepare the body in the right way, you can exceed expectations in athletics,” Wendel wrote. Although altitude training wasn’t a new concept in the early 1960s, it took the rise of sport science and the elevation in Mexico City to fully understand its effect. In 1925, Nobel Prize winning physiologist A.V. Hill created the term ‘oxygen debt,’ which described how, when individuals exercised or participated in athletics with an inadequate supply of oxygen, lactic acid was produced in muscles during exercise functions and converted back to glycogen in muscles during their recovery period. Altitude was not allowing enough oxygen to be absorbed by the body, and thus led to low-to-moderate muscular recovery and effort after training sessions. He expressed the need for athletes to extensively acclimate at altitude prior to competing, but he did not understand the matter enough to offer guidance as to how long they needed to do so. Regardless of the degree of research prior to Mexico City being awarded the games, athletes and scientists knew participating in an elite athletic competition at high elevation was going to have some effect on performance. The Summer Games was not the first premier global sporting event staged in Mexico City. The 1955 Pan-American Games featured many of the same events as the Olympic Games and served as the cornerstone for IOC President Avery Brundage’s opposition to scientific findings regarding the 1968 Games. However, reports of the altitude impact on the Pan-American Games competition were largely subjective, based on how competitors felt after their events. One athlete said he was “exhausted” after completing his event. Pan-American Games records were set in 16 of 22 events, seemingly giving the IOC little concrete evidence that the altitude was playing a negative role in the competition in Mexico City. Brundage’s opposition to the science had more to do with his agenda for the Olympics, which were emerging in the media spotlight as the premier sporting event in the world. The issues of doping, gender verification and amateurism within the IOC held more weight among the public eye when it came to presenting a polished final product on television, which for the first time in history was to be airing the games in color and live action. However, Arthur G. Lentz saw the importance of understanding altitude. The administrative chairman of the American team and assistant director of the United States Olympic Committee lobbied that in order to test altitude effects in athletes efficiently, it would be best to take a group of athletes to Mexico City and allow them to work out on their own after conducting private, controlled preliminary tests. Instead of conducting research and spending resources to get to the bottom of what needed to be done about the altitude issue in the 1968 Games, the IOC organized “pre-Olympic” research weeks in which elite athletes could be tested in the actual athletic facilities with state-of-the-art equipment instead of using primitive research studies conducted at altitude of the past. For many sports scientists, professional athletes and Olympic committees, this was the golden opportunity use the state-of-the-art infrastructure provided by the Mexico City Olympics at the perfect testing altitude. In 1966, the International Sport Week for research drew 788 participants from 25 countries. In many ways, the week sparked individual countries’ plans for further testing at altitude. During this time period, many countries, including the United States, France and Great Britain, began sending athletes to state-owned altitude training centers. “The debate surrounding altitude prior to the 1968 Games was perhaps the first instance when IOC members were compelled to comprehend complex scientific data on human performance,” said author Alison Wrynn. During the International Symposium on the Effects of Altitude on Physical Performance held in March of 1966 at the University of New Mexico, Balke recommended to the IOC athlete training at high altitude before the Mexico City Games based on the research gathered from the International Sport Weeks. He said three weeks of pre-Olympic training was the minimum recommended, and, realistically, a period of six weeks would be best for optimizing performance. That recommendation was made formally to the IOC and the International Federations. Except Avery Brundage and the IOC had a different agenda. IOC Vice President David Burghley was also a major proponent of amateurism, much like Brundage. In the face of as much up-to-date research scholars, doctors and scientists provided, both men decided to ignore it. “I am not sure in view of the hullabaloo all over the world about the altitude of Mexico City that we should not permit an extra four weeks in the year 1968,” Brundage said. Rule 26 of the Olympic Rules and Regulations states any athlete who spends more than four weeks training for their Olympic event is no longer considered an amateur. This played a major role in the IOC’s decision regarding what to do about the 1968 Games. Forcing an athlete to commit more time to training during an Olympic year meant spending more time away from their job. Adding four extra weeks of training would put added strain on smaller nations’ Olympic committees’ finances. Due to the rules of amateurism that prevented payment of the athletes at the time, many already were dealing with hardships and the financial strain that comes with training athletes for Olympic competition. Brundage, Burghley and the IOC saw the information presented by outside medical and science professionals as unimportant, largely because of the success of the 1955 Pan-American Games. So despite opposition from athletes and sports scientists, they set only a two-week addition to the four-week training period already allotted to the athletes. Once the Mexico City Games began, it became apparent from the first event that the altitude was going to play an integral role in the competition. In the first distance race, the men’s 10,000 meters, Neftali Temu of Kenya won gold, followed by Mamo Wolde of Ethiopia and Mohammed Gammoudi of Tunisia. Since these African distance runners trained at altitude in their home countries, they were better acclimated to run in Mexico City’s conditions than those from countries with lower altitudes. Temu’s time, while good enough for gold, was 1 minute, 48 seconds slower than Australian runner Ron Clarke’s world-record time. In Mexico City, Clarke collapsed at the end of the race and was unconscious for about 10 minutes. The story kept repeating. The men’s 1,500 was swept by Kenyan runners. The men’s 5,000 was dominated by African runners as well. World records were set in all of the men’s track events 400 meters or shorter along with the field events. The most famous of those records came in the long jump, which was won by American Bob Beamon and his 29½ foot effort. It seemed, as the scientists and data predicted, the altitude was having a greater effect on the performances of elite distance runners, jumpers and throwers than Brundage and the IOC expected. 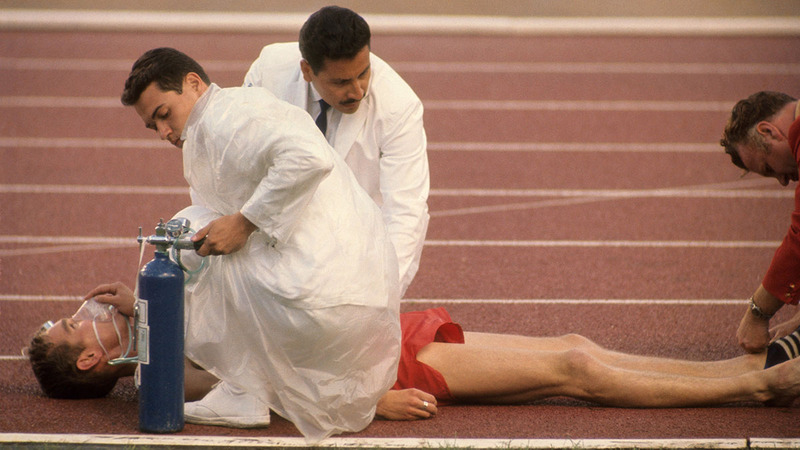 After the 1968 Games, the consequences for athletic performance based on how altitude affects the supply of oxygen within the body became a focal point of research. So did the emphasis on athletic training at altitude. Athletes quickly understood that if they were to reach their athletic goals, training smarter was key. In addition, by the end of 1968, many athletes had begun the ideological transition from amateur to professional. They moved to cities or areas located at high altitude to live and train there. Based on the research that became available after the 1968 Games, the USOC moved their home base to Colorado Springs, Colorado, in 1978. The city’s location 6,000 feet above sea level has been helping American Olympic athletes train since.